Lady Stardust Faro-Portugal to Barcelona - 2010 - The Rock! 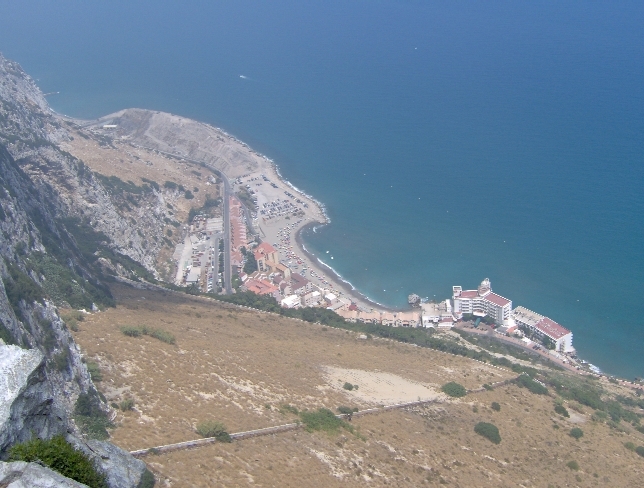 The Apes’ Den, which I dearly wanted to visit, is halfway up the Rock and can be reached by walking, cable car or taxi. By setting off before <?xml:namespace prefix = st1 ns = "urn:schemas-microsoft-com:office:smarttags" />noon we hoped to do most of it before the hottest part of the day (3-7pm). Reaching the runway we saw masses of people, lots of police and military officials and an army bomb disposal van, and there was a ban on vehicles crossing the borders. Paul asked a policeman what was happening but he just mumbled something about an incident. Luckily it didn’t delay us too much and after refusing an offer from a ‘tour guide’ to join a guided tour of the Rock for 25 euros each due to the cable cars being closed, (they weren’t) we queued up to board one of the cars. 9 euros each takes you up the Rock, includes a visit to the Apes’ Den and nature reserve and brings you back down again. The journey took 6 minutes and the views were fantastic. At 500 metres the Rock is higher than the Eiffel Tower. 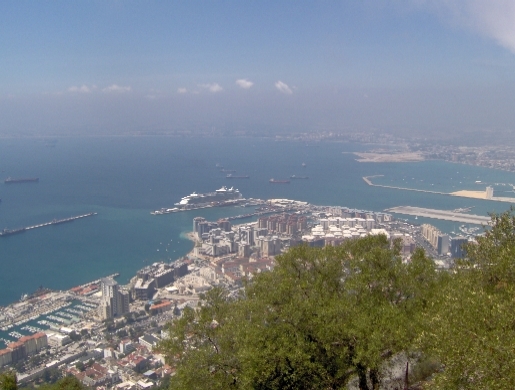 On one side is the Atlantic Ocean and on the other the Mediterranean Sea with the Atlas Mountains and the North African Coast visible in the distance. 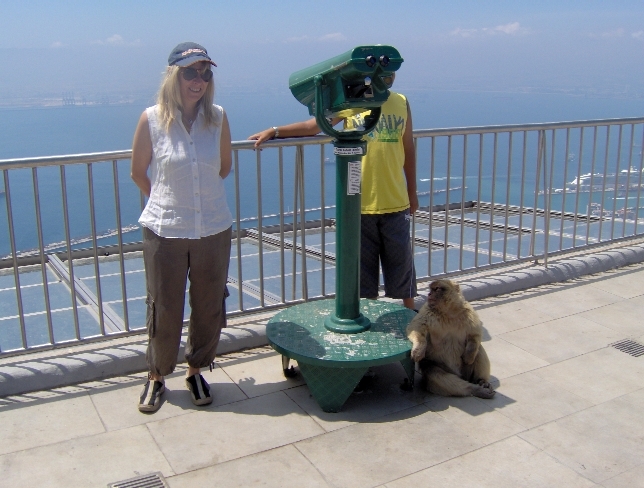 The tailless Barbary apes are apparently there due to sailors bringing them there as pets in the 18th century and the legend that as long as they remain on the Rock it will remain British territory means that they are protected and well-cared for. We were warned by numerous posters when queuing for the car that they are prone to grabbing things from people. They especially like to hurl cameras down the Rock and to pick pockets. 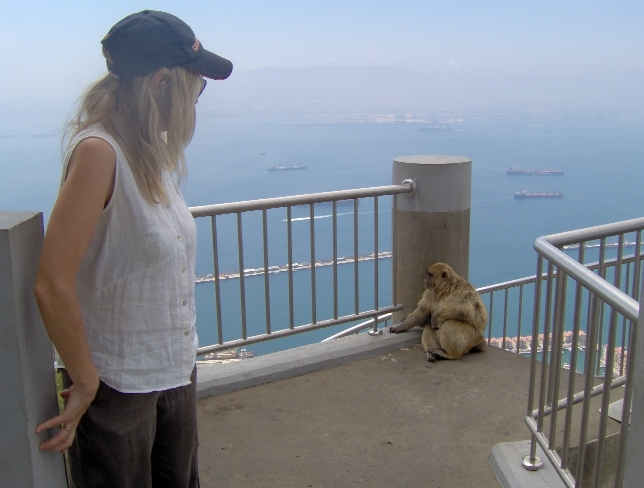 A spiral staircase leads up to the summit once out of the cable car and it was there we saw our first monkey. Paul gallantly suggested I go first up the stairs even though I was a bit nervous. 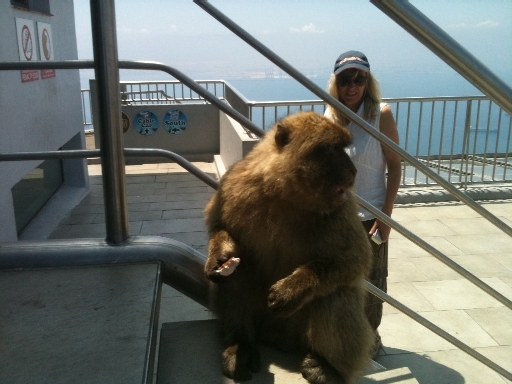 I’d made sure my belongings were safely packed in the backpack but as I passed the monkey he grabbed my leg. Drama queen that I am I thought he would sink his teeth in next but he just pulled an empty crisp packet from my pocket. I was a bit shaken but it was funny. The apes are fascinating – they seem bored with the tourists yet pose nonchalantly on the viewing platform for them while cameras flash. They grabbed a few more bags and ice creams too. Walking higher up the Rock we saw more apes and the drop below was sheer in places – a truly breathtaking and exhilarating experience. Signs and displays on the route told of the Rock’s history through the decades. It was very hot by 5pm so we stopped in a café for refreshments and made the radical decision to walk back down instead of taking the cable car. It’s three miles down and took us two hours but it was great. It was so peaceful and lush trees provided welcome shade. More places of historical interest were marked out for us, including several spots where ‘the Queen and Prince Philip stood to admire the view in 1954’ and more interestingly, some WW2 tunnels (33 miles long) which were dug into the hillsides in 1940 in preparation for a potential invasion. Back in the town with aching calves, sore feet and a raging thirst we sat in a bar to rest awhile before hitting the shops for some duty free bargains. Unfortunately all the shops were just closing so we had to make do with getting some cigarettes for Paul’s dad and a few bottles of brandy from the side streets near the border. Back at the boat despite an exhausting day I made a huge Mediterranean veggie dish to see us through tomorrow’s 48 hour passage to Cartegena.